In the mystery of God's love and grace God created the first man Adam and Eve out of him. God sent Jesus to restore the marriage. John and Sarah were received in Jesus. This wedding marks the first wedding among the third Gens in UBF. John is from the Univ of Milwakee Medical School, won residency as an MD. Sarah Little is grand daughter of late Dr Samuel Lee. Once she grew rebellious and lived like an unbeliever but later repented and the Lord has used her as a fruitful Bible teacher leading more than 12 to Jesus during her college days. Once upon a time she heard about John asking about her. The courtship began and it lasted two years. John fell in love with her but decided not to kiss her until marriage. Sarah Little was a bit disappointed but respected his integrity. Now the Lord brought the two together for marriage. 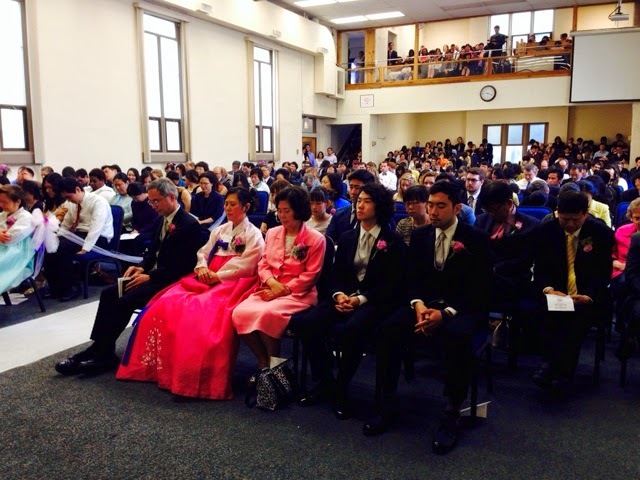 They commit the marriage to serving the Lord. 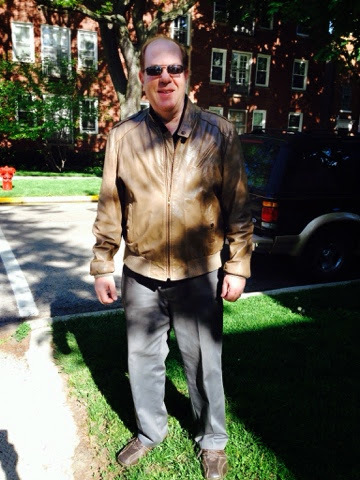 On May 22, 2014, I arrived at the O'hare at 3:00 pm. Shepherd Don Kuper greeted me. 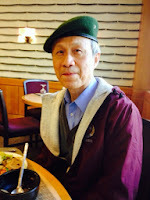 He used to serve as a pioneer in Argentine UBF but in 1991 he turned leadership to Marcus Kim and came back to the US. During the ride back to the Chicago center he said of Chicago saying the city is getting increasingly Multicultral, crowded with a lot of people from everywhere esp from arabic apeaking countries india and a lot of polish people, making Chicago diverse. In chicago every where you see people from every quaters of the world. Don also said: What is local becomes far away what is far away becomes local due to Internet; It looks like The US is in decline as a super power whereas china is frontier of mission because she is becoming new super power but no matter what I or anyone says about the US there is always hope for America! ; it is interesting to see Osama bin laden hating America still with himself wearing the US army uniform and underneath arabic tunic, in his wrist Timex sports watch holding ak russian rifle using microphone global internet. 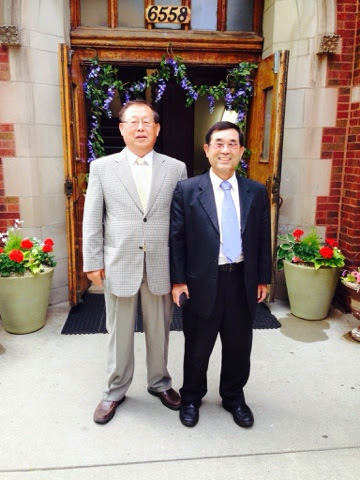 Don is one of ancestors of faith of Toledo UBF. He now works as a full time staff member. With his wife Hanna he has two sons: Paul (27) and John (25). I was asked to stay at the Riyadh house. 6:00-7:00 pm Dinner at Lyad House RM 1-W.
9:00-12:00 am Discussions and prayers for 2015 North America staff conference, Regional staff conferences, short term missions, staff education, etc. 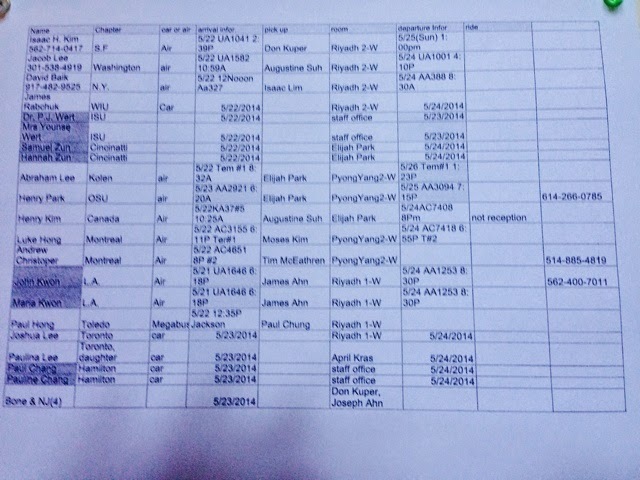 3 new staff members were added so the total no became 21. What: come to His precense through the altar of burnt offerings in full faith in Jesus the Lamb who offered himself as an atoning sacrifice. Come to the altar of incense there Jesus the high priest offers prayer on your behalf. As you converse with the Father remember the words of Jesus like John 14:13-14. Do not forget that the Father already knows what you need. Why: the Father wants relationship with you, so in this relationship, you would find who you are, the true self, as created by God fearfully and wonderfully. The other day I watched on a CNN News program a man starting to cry as he was being given an interview. 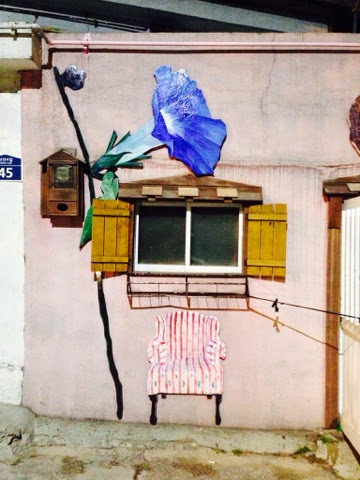 This man had a house on a scenic spot with an ocean view in the Big Sur area. Unfortunately due to the brush fires, smoke was going up around; the fire was crawling in. The fire department issued an evacuation order. But he could not. The reporter asked the man, "Why are you not evacuating?" The man said, "How can I? This house is my life: I've got to protect it." Then he started crying. I don't know what is going to happen to his house. Will the fire die down? Would he be able to save his house? What if the house burnt down? What if he did not have an insurance? This man was in his early 50's. Will he be able to bounce back? Many questions were asked about the purpose of 1 and 2 Chronicles. But one most appealing answer would be for the Ezra to prepare his return to the Promised Land. As many Bible scholars indicate, it must have been Ezra who wrote 1 and 2 Chronicles. Assuming that it was to get himself ready to return to Israel and reform the nation that he wrote these two books, which I believe is the case, we can better understand what might have gone through the mind of Ezra as he applied himself to the compilation of the chronicles. 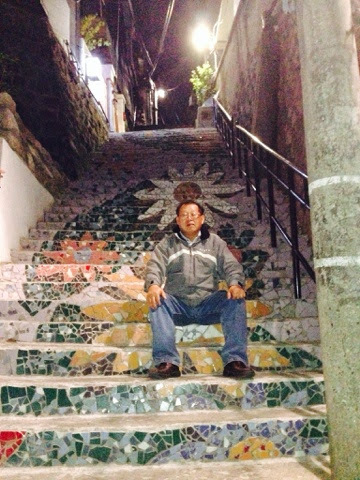 As we pull ourselves through our life in a physical body on this side of the grave, we find that three things are difficult to accomplish: first is to succeed, second is to maintain success if one has ever been able to garner it, and third is to crawl back to prosperity after one hits rock bottom. In the two Bible verses we read, it can be seen that the Israelites went through the experiences that are related to the first two categories of difficulties. They once upon a time rose to the highest point of successes. Did they manage the success well? No. Now that they fell all the way down to the rock bottom, the remaining question for them would be, "Do we still have the hope to rise to the glorious state as a kingdom of priests and a holy nation?" Or assuming that there is still such a hope for them, "Do we have the courage enough to work on this hope?" In order to garner enough courage and strength to work for this hope to come true, one of the first things one must do is consider the glorious state from which he slid. What then was the glorious state in which the Israelites used to be? And how did they manage to arrive at such an exalted state? Again, in Ezra's mind, the expression "the people of Judah" answers the questions. In fact as we briefly covered in the lecture for the book of Judges, this description "the people of Judah" not only gives out the correct definition of "success" but also the "means" (or "formula" if you will) of fulfilling the desire to succeed. Judges 20:18 reads, "The Israelites went up to Bethel and inquired of God. They said, "Who of us shall go first to fight against the Benjamites?" The LORD replied, "Judah shall go first." Judges 20:18, particularly the instruction "Judah shall go first" defines what success is all about. Many people want to be successful, not knowing what being successful is all about. What is success? Who can be viewed as a "successful" person? That is a good question. But from a Biblical standpoint success refers to the state in which one has met all the needs he has, so that he is not in want of anything; therefore from the bottom of his heart he can say, "I have all I need for life." In this way, success can be defined to mean "total satisfaction" with the satisfaction permeating through all different levels of his existence. As man exists on [roughly speaking] three dimensions - the dimension of God, of man, and of material - in order for one to be called "successful", one must attain to a state where one has met all the needs one has on all the three dimensions. Since these three dimensions correspond to spirit, soul, and body, one must secure all the components that are necessary to generate total satisfaction on all different levels - on spirit level, on soul level, then on bodily level. Functionally, spirit is a vessel to hold God, soul is a container holding you, and body is a hardware (or form) to let you occupy a location in a time space continuum. The order (of satisfaction) here is VERY important. The order is the order (of time and of direction) in which the streams of blessings making man deeply satisfied flow into his life, so that where spiritual needs are met, soul's needs are met. Where soul's needs are met, bodily needs are also met. It never works the other way around. No matter how much one is satisfied on a physical (or fleshly) level (by stuffing one's stomach with lots of food), where one's soul is NOT properly nurtured with soul food, one's soul will never be able to find satisfaction. In the same way, just as the soul's prosperity does not depend on bodily pleasures, so also the spirit's prosperity does not depend on the soul's wellbeing; rather, the soul thrives only as one's spirit thrives. Of equal importance is the magnitude of the needs we have on each level: the spirit's need is infinitely great; the body's need is minimal (or virtually "nothing" compared with the greatness (or significance of the spirit's needs); and the soul's needs are coextensive with the needs of his spiritual and bodily existence (Gen 2:7). The account of Leah in the book of Genesis serves as the case in point. She used to seek satisfaction from her husband Jacob. So she kept demanding her husband to come to bed with her. In a way she was like the Samaritan woman who was looking to quench the thirst of her soul at the Jacob's well (that is, from her relationship with her [five] husbands and one room mate]. But none of them was able to quench her thirst. But when Jesus came, he offered living water which is Jesus himself. On finding that Jesus is the Savior, she left her water jar, ran to her town, and with great joy, invited townspeople to meet Jesus saying, "Could this be the Christ?" Leah used to be the same as the Samaritan woman. Like the Samaritan woman the more she demanded Jacob the more Leah grew thirsty. Finally she turned to the Lord. Then on giving birth to Judah she named baby saying, "This time I will praise the Lord." She then stopped having children, which indicates that she found the living well which gives her true satisfaction. The statement, "This time I will praise the Lord" also shows us the way to become successful in all we do: While success is defined to mean being no longer in want, praising the Lord serves as the key to participating in the world of the Lord's infinite perfection. In the Lord's mountain one can find all one need for life. And the supplies we get out of our relationship with the Lord are without a limit. We are limited, but God is not. So by being connected with what is without a limit, we can then be made fully sufficient. As a nation this was how the Israelites rose to the all time high in their career as a priestly nation. While they were in Egypt they were pushed down to the lowest level of the society. For a while they endured. But as the oppression mounted up they could no longer bear it; they cried out to the Lord for help. In his mercy the Lord sent Moses to save them. After saving them from the power of Pharaoh the Lord invited them to himself. There at Mt. Sinai the Lord secured a covenant relationship with them. In exchange for the Israelites' promise to love and obey the Lord, the Lord promised to exalt them high above all nations as written in Deuteronomy 28:1,"If you fully obey the LORD your God and carefully follow all his commands I give you today, the LORD your God will set you high above all the nations on earth." The Lord then empowered Joshua, so that through his leadership, the Israelites took possession of the land. During the days of the Judges, the Israelites went through ups and downs. Eventually the Lord established David as a shepherd king over Israel. Under the leadership of King David, the Israelites tasted sweet victories. By the time King Solomon came, as Solomon sought after the Lord, especially the Lord's wisdom, the Lord put the Israelites "high" above "all" nations, as 1 Kings 4:34 testify: "Men of all nations came to listen to Solomon's wisdom, sent by all the kings of the world, who had heard of his wisdom." Again as we live in this world, we find it hard to become truly successful as the word "successful" is defined in the Bible. Why is it so hard? First of all true success (in the true sense of the word "success") does not depend on men. No human being can make us succeed in the true sense of the word "succeed". But we are meant to succeed in all of our ventures. This is because we are created to rise above all creations. In order to equip men to be more than conquerors the Lord God crowned men with honor and glory (Psalm 8:5). How then can we rise to the highest heights? It is through following the formula, that is, "This time I will praise the Lord". We need to look up to the Lord, and learn of him. As we worship him in spirit and truth, the Lord in turn inspires us to rise above all creations, so that all who look to him would rise to his infinite greatness. 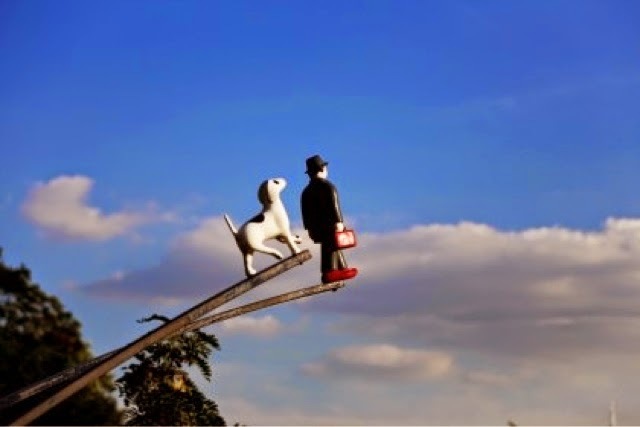 The next thing which is hard to accomplish is to maintain the success one has secured. In the case of the Israelites, by the time King Solomon came to rule the nation, they reached the highest point of their career. In the book of First Chronicles, Ezra summarily described the high points of the Israelites in the Promised Land. He also highlights the high score earners such as David's mighty men. But alas! They were not able to maintain the victorious standing as a priestly nation. They went downhill, until they were taken captive to Babylon. Why then did they become what they became? We already know the answer: they started to focus more on creation rather than on the Creator. More specifically, the cause of their down fall is found in the very word "captive". The word "captive" is the same as "the conquered" or "the subjugated". They lost control over themselves. Someone or something else other than the Israelites came to take control over them. This is not the way God created man. It is against God's will that man gets dominated by God's creations. According to Genesis 1:26-28 man's mission is to become dominant over creations rather than dominated by creations. But each time one loses sight of the Lord God, the Creator of the heavens and earth, one ends up being dominated by creation. In the case of David, at the height of his success he came to be dominated by a lust problem. So he no longer became worthy of great blessings such as the position of a shepherd. So he went down to a pit real fast. The same was true with Solomon. After reaching the zenith of his career, he started focusing on what is fleshly. As he lost his heart to what is physical, he rendered himself no longer worthy of the greater blessings such as the ruler of a priestly nation. Speaking of the way in which one can perpetuate successes in the Lord, the Scripture says, "Be holy, because I am holy." Lev 11:44 One of the fundamental meanings of the word "holy" is to be free from [the dependency on] created things. Speaking of the same truth, the Apostle Paul says, "It is for freedom that the Christ has set us free." Gal 5:1 Therefore, by attaching ourselves to the Lord Jesus Christ, we can perpetuate the blessed state our Lord Jesus has secured for all who believe in Him. Part III. Now the first to resettle on their own property in their own towns were some Israelites. The third thing which is hard to fulfill is to crawl back to an exalted state after one has fallen from an exalted state way down to a lowest bottom. Figuratively speaking the challenge we talk about here is like a man who used to overeat for decades so that when he is supposed to weigh 150 pounds, he ends up weighing 300 pounds. Can he now have the hope to be in good shape, as slim and well fit as an Olympic swimming champion? Another example would be a young man, who after committing horrible crimes, serves a prison term for life, but is lucky enough to get released from the prison. However by the time he walks out of the prison gate, he is already in his late sixties. What hope then would there be for him? Theoretically all things are possible. Doesn't even the Bible say, "Everything is possible for him who believes"? But to dream dreams is one thing, to actually go for a dream or dreams is another. By the time Ezra wrote the first and second Chronicles, Ezra had a great challenge. He had to lead the returnees back to the Promised Land. It was a long journey involving a distance of 500 miles in a straight line. Most likely, as he was to lead a long caravan, he had to anticipate the distance of the journey doubling, if not tripling, up. In our day we have airplanes or cars or rail ways. But in those days they had to travel mostly on foot. But the greater challenge was inside of men; and the challenge was to rekindle in the hearts of the people returning to Jerusalem the hope to live as a priestly nation. After going back to the homeland, will each returnee be transformed into a man worthy of God's call? 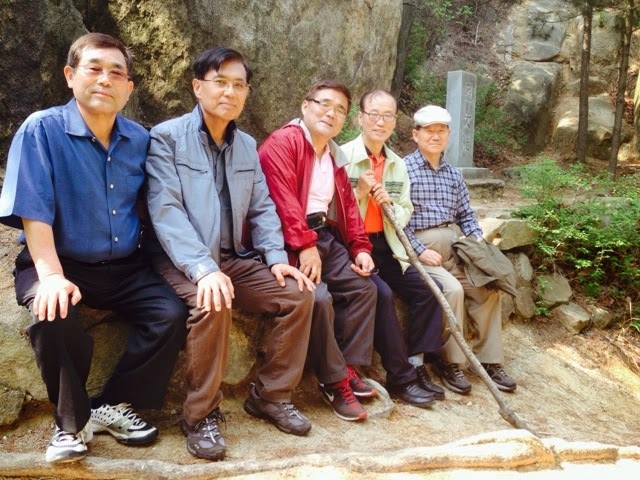 How can a community of people who after more than 70 long years of assimilation into heathen cultures be molded into a new batch of people filled with the Spirit of the Holy God? But in the key verse for today, the Prophet Ezra saw that already the Lord God rekindled the light of the hope of a new beginning. In fact to some, it was no longer a hope but a reality, for with this hope, they acted and started out on the journey back to Israel, and indeed they began to resettle in the holy land. Speaking of this people, 1 Chronicles 9:2 reads, "Now the first to resettle on their own property in their own towns were some Israelites, priests, Levities and temple servants." 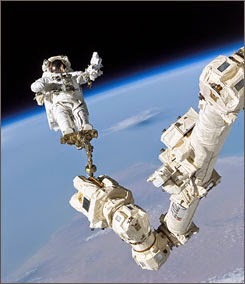 When we were in the Long Beach area, we had a space problem. As we prayed for the problem, the Lord granted us to move up to Downey. But at that time the Downey Bible center was still in ruins. Yet, in expectation of making a new beginning, the first family to move from Long Beach to Downey was Shepherdess Connie's. Since they first moved to Downey, my family moved to Downey. Then, in June 2000 we had a center dedication. But let us notice the word "resettle". We did not move up to Downey to "resettle". But in the passage some of the chosen people Israel were the first to "resettle". This word "resettle" represents a bold step towards fulfilling the hope to reinstate Israel back to the original purpose of God's calling as a priestly nation. In this respect we can call these people the pioneers of God's hope for perfect redemption. In conclusion, Ezra recounted the history of the Israelites with the daring hope to restore them back to the original purpose of God's calling. In our own generation as we live in this nation America, we are encouraged to pray that the Lord would restore our nation to be a kingdom of priests and a holy nation. May the Lord bless us to never stop praying that the Lord would use this nation as the city on a hill. 2. The first Chronicles begins with the word "Adam" and ends with David providing everything necessary for the building of the temple. How are the two [Adam and readiness for temple of the Lord] related to one another? 1) Not the denial of the free-will, but the affirmation of it. In reading the prophecy fulfilled in the story of Josiah's reformation in second kings 23, one question arises: "If God is all knowing is free will illusion?" About 340 years prior to the event, it was prophesied that a son named Josiah would be born in the house of David, doing the reformation, bringing down the altar Jeroboam had built. So more than 3 millennium before God knew Josiah would be born and do what he did. Does this mean God is all knowing and therefore all controlling rendering the idea of free will to be an illusion? The answer of course is no. Why? 1Ki 13:33 especially the phrase "Even after this" affirms the free-will. The Lord believes in the free-will, so he expected Jeroboam to choose good over evil, yet "even after this (including the prophecy on Josiah)" he chose ways that are evil. 2) No longer unbelief, but absolute faith in Him from first to finish. Question becomes, "Why did Jeroboam choose that way?" There were seven miracles given to him. (a son named Josiah to be born 340 years thereafter, undoing what Jeroboam was doing; altar split, ashes falling off; hand shriveled up; hand restored upon receiving prayer; the death of the man from Judah; the lion not touching the dead body of the man; the man buried in a heathen town) Yet why did Jeroboam fail to change his ways? The dream for happy marriage, and then to make a home, sweet home, is not just for men (and women), but also the Lord, the Father of Heaven and Earth. 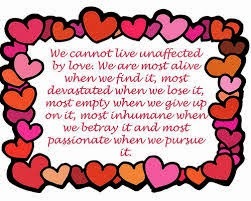 In fact, it was and is cherished first by Him. It has been said, "Moses dipped the water out of pond, David caught fish, and Solomon ate up all." So far so good. The party continued a little more. Then Manasseh came in, and the party was over. 2Ki 21:14 Divorce procedure was completed. No more home. Children were scattered. What is the cause? Manasseh? Could be. After all his name "forgetful" fit what he did: he forgot the pledge of loyalty to the Lord. But who gave birth to him? Hephzibah! What? Doen't Hephzibah mean "I delight in her"? Still what happened was what happened. Did the Lord give up on Zion (which is an idiom for the Lord's dream for happy marriage, making home, sweet home with his Bride and children, lots of them)? No. Why not? Isaiah 62 answers the question. He is going to call Zion once again my "Hephzibah", AND "Beulah" (meaning "bride"). Is it going to be only dream and dream alone? No. Why not? The word 'down' is "directional". If it is down, down to where? Jesus answers the question, that is, to 'earth' for he asked his disciples to pray, "Our Heavenly Father, hallowed be your name, your kingdom come, your will be done here on earth, as it is in heaven..."
So the dream for marriage is seen cover to cover in the Bible, first in the Garden of Eden then in the Book of Revelation the last two chapters. The first two chapters of the Bible talk about the Perfect Paradise, and the last two chapters of the Bible describe the Perfect Paradise Restored! So never give up on the dream! Cherish it. Dream the dream, and come to Lord, and receive it! 1. What do the expressions "a crown of glory" and "royal diadem" (Isaiah 62:3) have in common with "the Holy People" and "the Redeemed of the Lord" (12)? 2. What do the following have in common? It matters whom you marry. The Lord has a will purpose and plan for mankind. His will and purpose is to bless each person as fully as God Himself is. The plan is seen in calling his children "virgin daughter." His purpose and plan are not just for a special race, nation, or tribe, but all peoples on earth. This is seen in the way He calls the Jews and the Gentiles. In the Scriptures the title 'virgin daughter' is repeated ten times. And the Lord calls the Jews and Gentiles as such. He calls Zion "virgin daughter', Sidon "virgin daughter', Egypt "virgin daughter', and even Babylon 'virgin daughter'. A virgin has a dream for future, the dream to fall in love with the prince charming, build a family, and much more. In order to make the dream come true, the Lord God sent His one and only Son Jesus, that through the union with Him, each of his children would be fully blessed, bearing fruit that lasts forever, as is said in 2Co 2:11, "I promised you to one husband, to Christ, so that I might present you as pure virgin to him." Who you marry makes difference. And He is the one who can let the shadow of the sun on doorsteps go not just 10 steps forward but also backward. If anyone can find it difficult to understand the will of the Father, try to get into the heart of a good father who has a virgin daughter. And He has not just one or two virgin daughters to marry but tons of them. 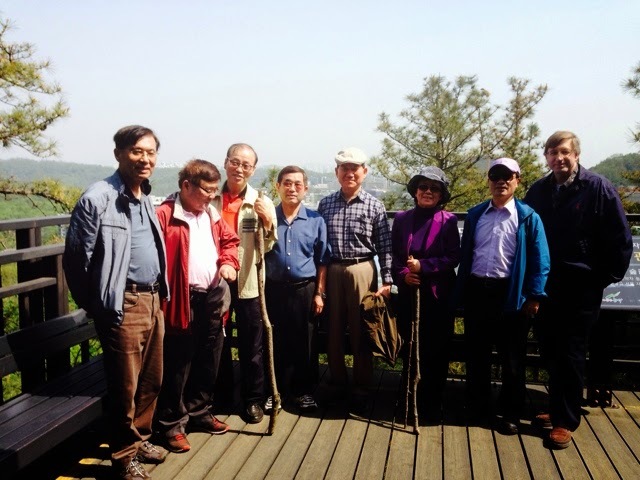 Dr. Samuel Lee used to climb the mountain during the pioneering stage. There he prayed seeking His will. 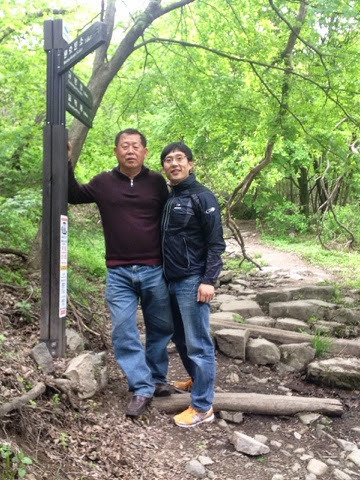 I took Young Revolution Lim with me for the hike. He is in his early 30's, a missionary candidate to the U.S. During the hike we had a discourse on Acts 1:8. 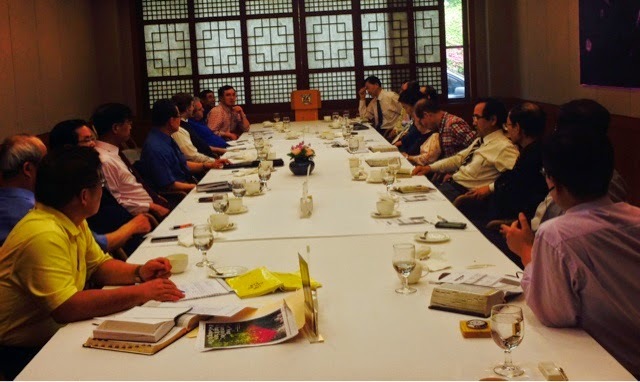 Many ask "How did the UBF ministry start?" 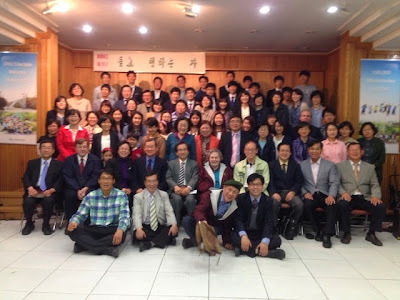 In Kwangjoo at Daein-dong where Missionary Sarah Barry and Dr Samuel Lee first started the ministry a history museum stands. Kwangjoo UBF I serves Jeon-nam University students. Lately they opened a new chapter serving the University of Heath and the University of Science and technology. 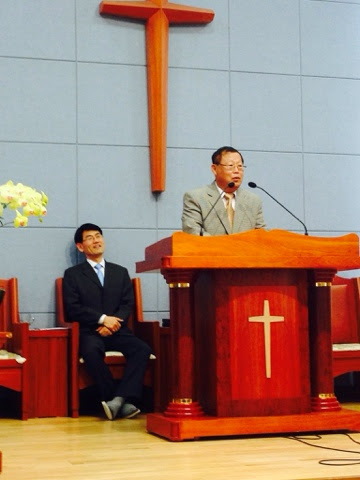 I attended two worship services one for Jeon-nam another for new chapter, and shared a testimonial message entitled "The Lord needs you" (Matthew 11:3). At 2:30 pm I left Kwangjoo for Seoul by bus and arrived in Seoul around 8 pm. Missionary Paul Koh his wife Grace and Shepherd Caleb Kim were waiting for me. I took them to a dinner fellowship. 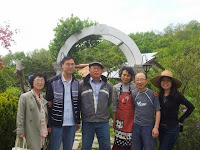 Dr Paul Koh visited Korea with 5 UP students. He will return to Manila this week. Bidding Lord's comfort for Nehemiah Kim of Zambia. 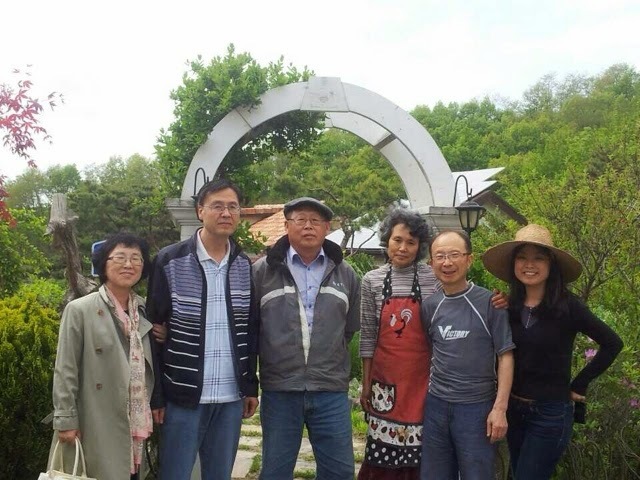 He visited Korea to pray for his ailing father (76) who is terminally ill for liver cancer. During his childhood his father left the children never to come back. He grew up under his grandmother. Now onhearing the news that his father is terminally ill he visited the father to a hospital, forgave him and prayed for him. 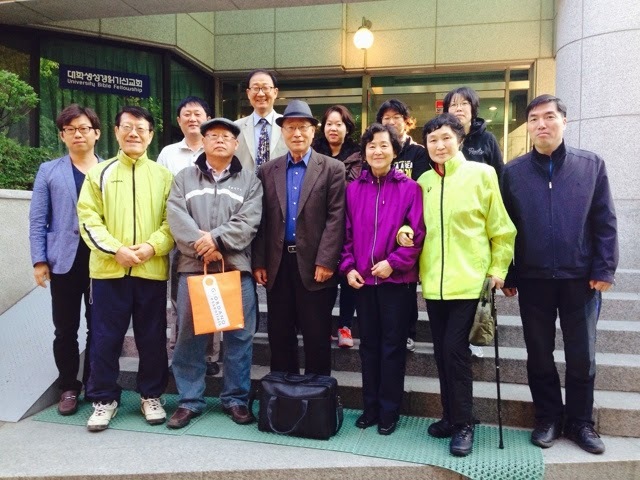 At 7:00 am Shepherd Samuel Choi and other Chongno UBF coworkers came out and had a 'sending out' prayer meeting. 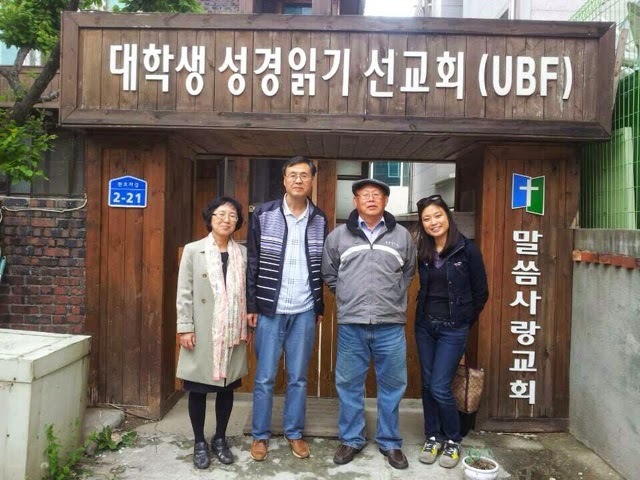 As of April 2014 the Board of Directors of Korean UBF re-elected Shepherd David Kim as the Korean General Director. 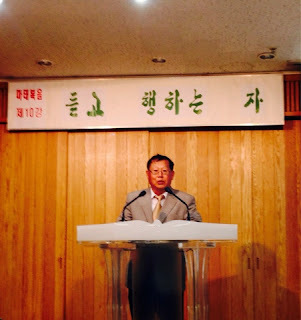 On this occasion Dr. Abraham Kim called for a senior staff meeting to be held from April 28-May 5 in Seoul Korea. The following is the summary of the travel. * From Redding to San Francisco - on learning of my plan to travel via Amtrak at 2:20 am from Redding station to SFS 10:50 am Dan gave me a ride. * Flight from San Francisco to Incheon Seoul, Korea was uneventful. At the Incheon airport Dr John Jun and Mark Yoon greeted me. 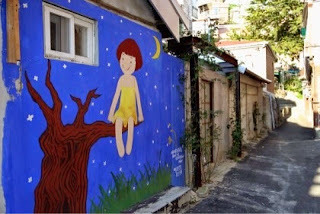 Mark Yoon gave me a ride and checked me into the Chongno Center around 7 pm. 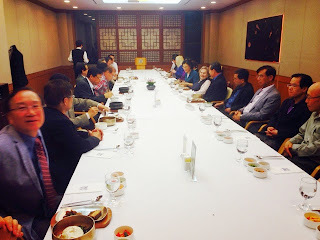 - Sunny's parents: they invited us to a lunch fellowship at their house. They maintain a home garden on a sunny side. Their cat Yangsoon gave birth to four kittens. 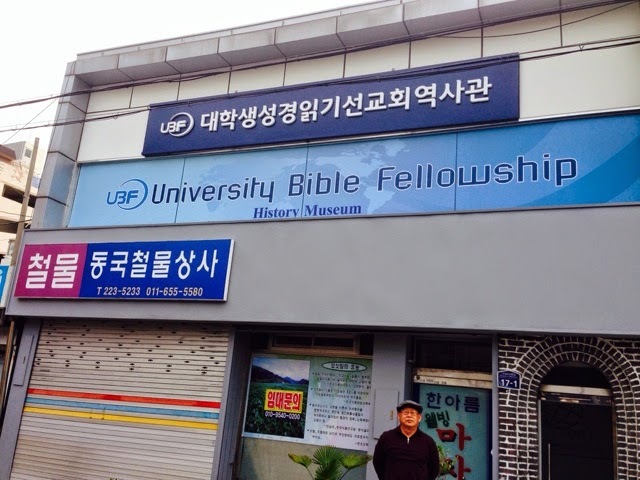 After lunch we visited Cheonan UBF and had a Bible study on 2 Kings 13:19. After the visit to Cheonan I came back to Chongno UBF around 8:00 pm. 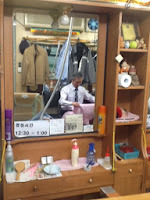 Then I visited a barbershop located near Chongno UBF center and had a haircut. 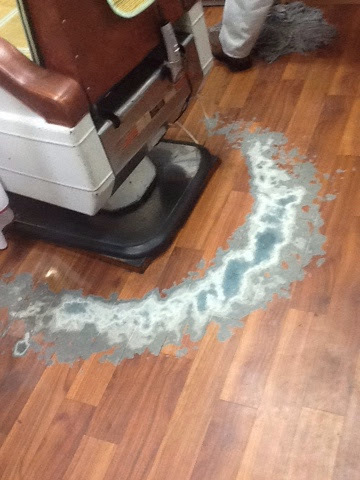 The barber has been working as a hair stylist for 53 years in one lication.The floor is worn out, due to his feet movements around the station for more than 50 years. He charges 5,000 Won ($5) for a haircut. He did receive a Korean presidential award for his faithfulness in his trade. 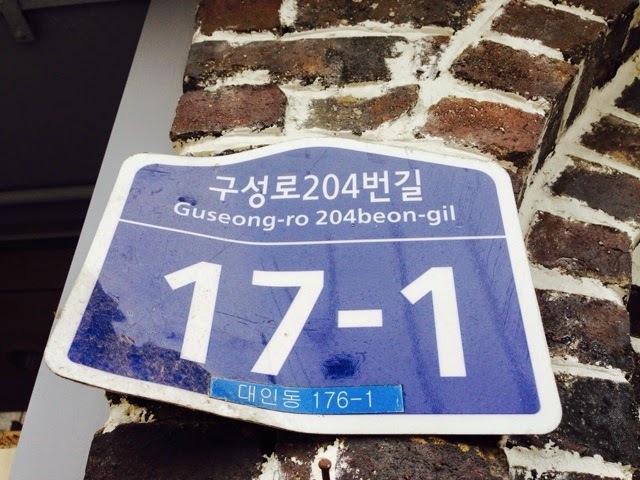 During the summer 1967 Abe left Seoul for Kwangjoo his hometown - a town which is about 600 kms away from Seoul. To invite Abe to a summer Bible conference Dr Jose Ahn visited from Seoul to Kwangjoo. At one of the watermelon fields in Kwangjoo he caught Abe eating watermelon. He said to Abe "The Lord wants to use you." Abe said "Let me ask my father." His father who was a buddhist was furious. Then Abe explained to him "My lawschool senior came all the way down from Seoul to here to invite me to an Academy." 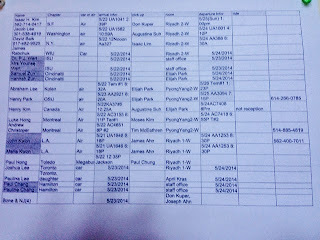 The father listened and said "Hmm, what kind of lawschool senior took the trouble of traveling such a long distance! The academy must be very important. Please go." 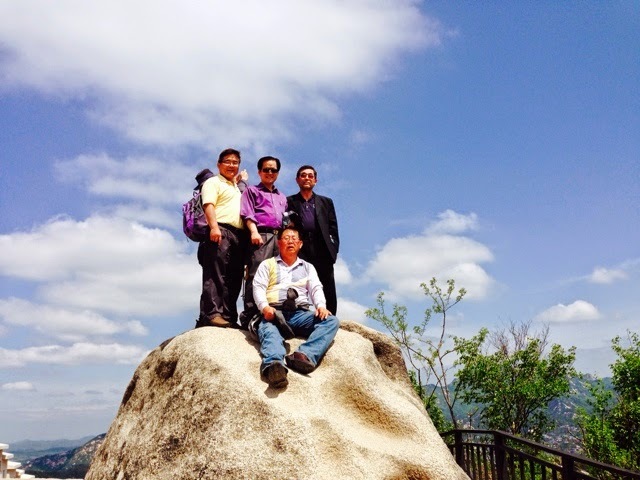 During morning hours I took several coworkers to a mountain climb. During the journey we had a good fellowship talking about the history of Korea. In the evening Kwanak III invited visitors to an open forum with Student leaders. 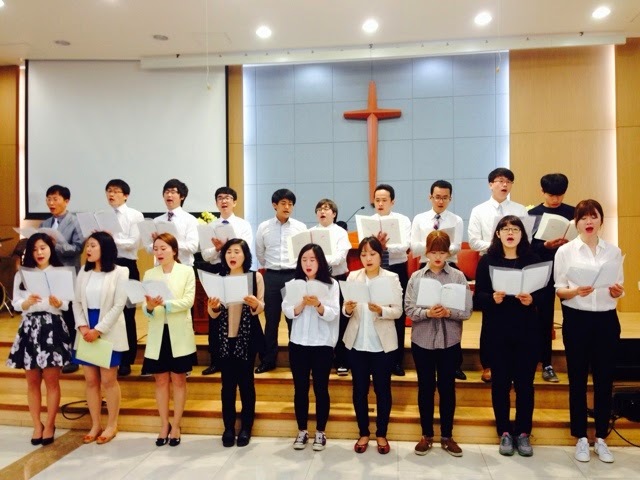 The program consisted of dinner fellowship, special songs, slide shows, Q & A session and words of encouragement. Although it was during final exams most of student leaders attended. 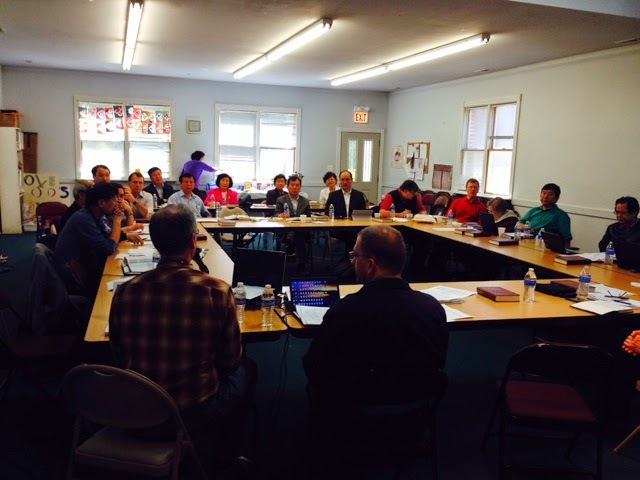 Heated discussion followed on: continuing missionary education; well being of retiring missionaries; organizational issues such as ordainment chapter directors etc. Next Dr Abraham T Kim spoke. The meeting was adjourned around 5 pm. After dinner from 7-8 pm the senior staff members and Korean UBF Board members met for conversation and prayer. 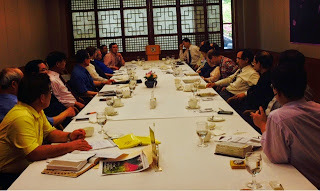 Discussion on current concerns issues and prayer topics (European Bible Conf; CIS conference; missionaries with health concerns; wedding between Wonil Lee and Yvonne; CME; child education) followed by a joint prayer. During the morning hours, along with Shepherd Joshua Kim of Kwanak III I visited one shepherdess to a hospital. Shepherd Joshua Kim is a staff shepherd serving Kwanak III. 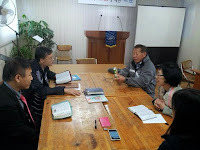 He is from Kimcheon High School, 20 years junior to Missionary Isaac H Kim (who also graduated from the same high school). 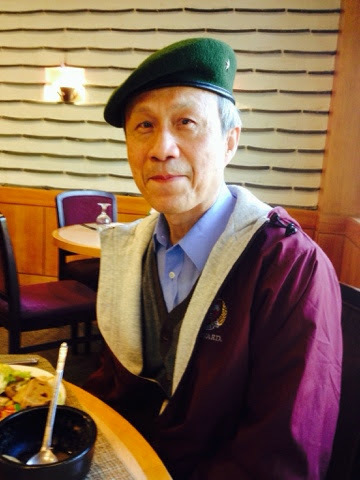 In 1988 he entered the Korea University. 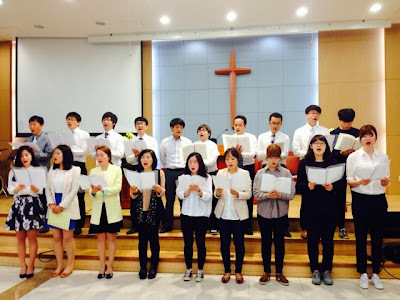 In spring 1989 he attended a club for the Kimcheon High School graduates in Korea University. 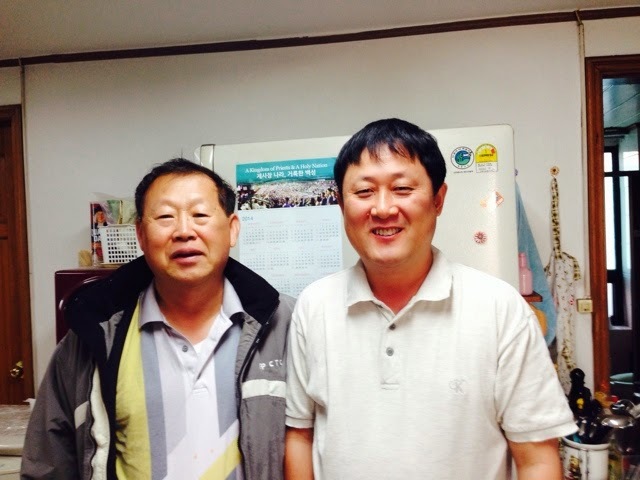 There he met Missionary Young David Cho who in turn invited him to Bible studies in Anam UBF. Deacon Hyojin Park is the elder brother of the husband of Elder sister of Joshua Kim. 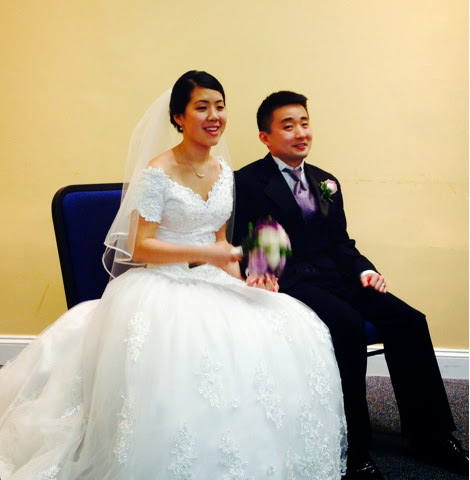 There was a wedding between Yevonne Timlin and Wonil Lee. It took place at the wedding hall located near the Chongno UBF Center. 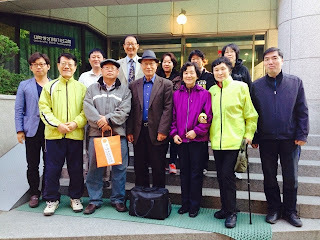 After breakfast at the Hoam Center in Seoul National University, I paid a visit to my elder brother. Three decades ago I shared the gospel with him. To this date he and his wife keep faith. 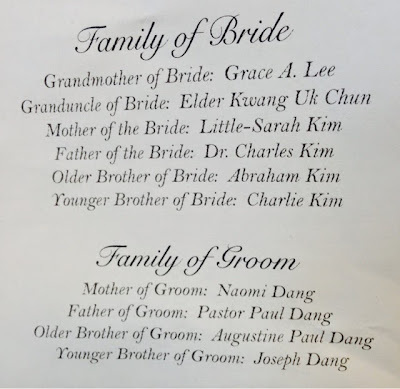 They have two children "Grace" and "Sungjon". 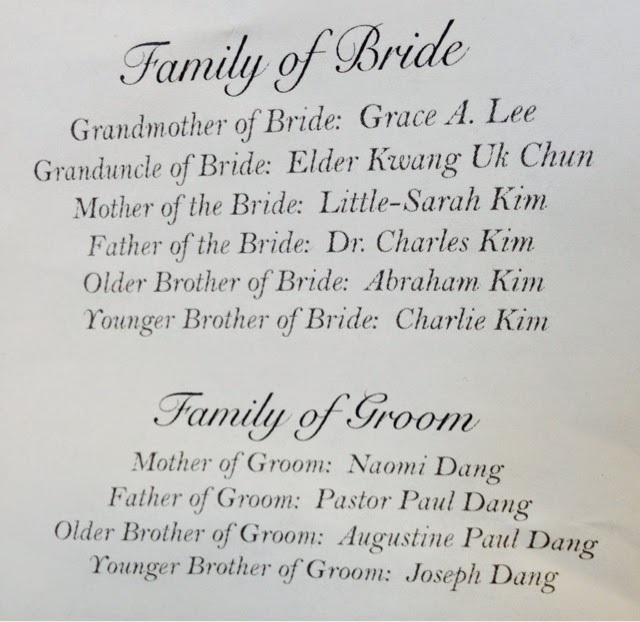 Grace married a fellow grade school teacher named Jung Hoon Ahn. 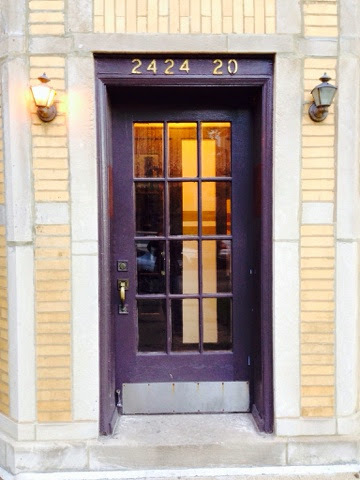 At their apartment I led a prayer meeting and shared with them one word: "Love is patient." (1Co 13:13). 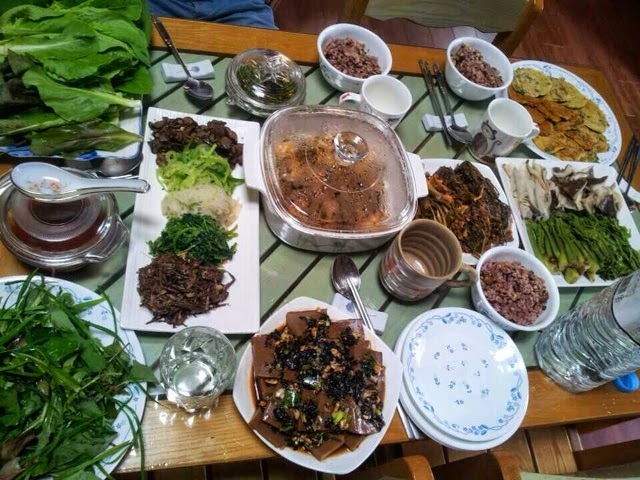 They invited us to a house-warming lunch at an eating place nearby. Before parting the company I gave a Bible study on Deuteronomy 6:4-6. 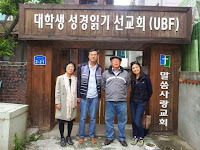 Next in order to visit a UBF museum in Kwangjoo UBF, Kwangjoo, I visited Kwangjoo by bus.